Manufacturing Technician student Sam Kabund Kaking is our May Student of the Month. 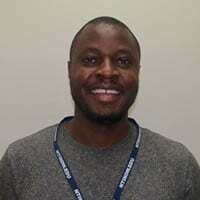 It is our honor to name Manufacturing Technician student Sam Kabund Kaking as May Student of the Month. From our first meeting with Sam at the Portland Career Center prior to enrollment, Sam proclaimed his intense desire for job worthy skills training. During his manufacturing training, Sam has demonstrated that he is a critical thinker and currently, after completing over two thirds of the curriculum, carries the highest-grade point average in the class. Sam’s attire is impeccable and his attendance is exemplary. When working through challenging assignments, Sam is always the first to complete his exams and shows respect for his fellow class mates with a head down commitment to the next assignment. Staff and students agree – Sam is an outstanding representative of NTI and its Manufacturing Technician program! Well done, Sam! It’s a joy to see you excel in the manufacturing field.